2015 was a year of double celebration. In November we celebrated 5 years of operation in Scotland – established nearly 20 years to the week after Patrick founded Atelier Ten in London. In these five short years, we have enjoyed a tremendous reception in the local marketplace exceeding all expectations. The year saw a number of projects successfully completed. Each project tells its own story about early support from our friends in the industry who had belief in our fledgling team – a team which already had some ‘previous’ in their passion for design and client care. The buildings that reached completion provide evidence of our commitment to design engagement while challenging convention across a variety of sector types. At Glasgow Academy, the Saunders Building opened to critical acclaim. The new science building features a mixed mode ventilation solution with cleverly detailed routing of building services to maximise flexibility in use. A displacement ventilation system ensures that the auditorium is comfortable irrespective of the number of occupants. The project has been shortlisted for a RIAS (Royal Incorporation of Architects in Scotland) award at time of writing. In the commercial sector, we completed One West Regent Street, which achieved a class-leading A rated EPC certification of only 8 kg CO2/m2/yr without the need for any renewable technologies. Reducing the carbon footprint in this way delivers real capital cost and life cycle savings with the benefit of ‘future proofing’ the scheme against further legislative tightening of greenhouse gas emissions. The scheme also benefits from the ground-breaking work by our US colleagues in the field of health and wellbeing. The building’s central air handling plant unconventionally does not have any cooling coils. Clearly a further commercial benefit for our design and build partner Sir Robert McAlpine, the real benefit is now being experienced by the building’s occupants who benefit from elevated provision of fresh air without the dehumidification which is often experienced in modern offices. The building was recognised by the Glasgow Institute of Architects (GIA) Awards in December. Further projects recognised by the GIA include the Shields Centre – a primary healthcare facility that won the overall award for sustainability. 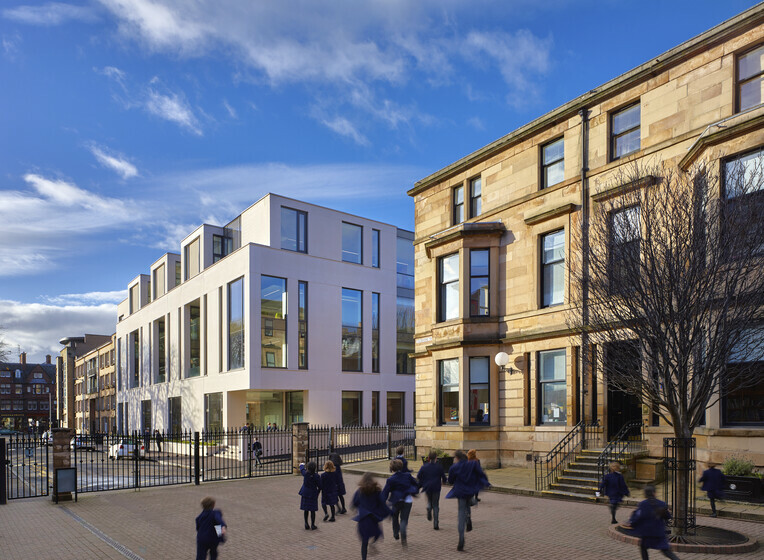 Our fire engineering team shared in GIA award spoils with wins for St Brides School and the Theatre Royal extension in Glasgow where fresh thinking in our approach has created spaces otherwise unimaginable by mere code compliance. Our investment in advanced smoke modelling and evacuation simulation allows an unparalleled approach. And, with Scott Hall leading the team, we know that such computer modelling is sense checked by a former fireman. This investment in technology and research resulted in Michael Waters being invited to present to fire engineering students at Glasgow Caledonian University; see side bar. In Edinburgh, Angus Roberts completed his first year in the new Hanover Street offices and was joined by Ben Shepherd from the New York office to present a talk on behalf of the BCO titled “Greening Manhattan”. The new office is delighted to be enjoying a wide range of work including the University of Stirling, the new members pavilion for the RHASS at Ingliston and the new visitor attraction to house The Great Tapestry of Scotland. Each member of the fire engineering team has a membership with the Institution of Fire Engineers (IFE). Through IFE membership, Scott Hall has been involved in a number of workshops, one of which was on the Design Verification of Fire Engineered solutions as part of a Scotland Building Regulatory System. The purpose of this workshop was to engage with stakeholders to better understand the issues and challenges involved in designing, submitting and approving a fire-engineered solution.